Although industrial gas flow meters are widely utilised for liquid and water applications, it has long been accepted that clamp on gas flowmeter technology could not be applied to mass gas flow measurement primarily due to fundamental theoretical measurement limits. In fact only 4.9 x10â€“7 percent of the transmitted sound energy is received by traditional ultrasonic transducers. 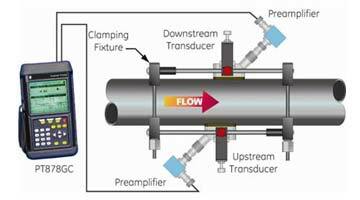 However, advances in clamp on gas flow measurement technology and processing have meant that despite lower acoustic impedance levels and higher attenuation levels in most gases, a clamp on gas flow meter can now measure transit times in gases where signal-to-noise ratios are extremely low. It is now possible to measure natural gas, steam, compressed air, hydrogen, compressed air and many more using clamp on flow meters. Portable clamp-on gas flow measurement with unrivalled accuracy. Suitable for metal, non-ferrous and plastic pipes with diameters between 20mm & 610mm and temperatures from -20Â°C to 230Â°C . 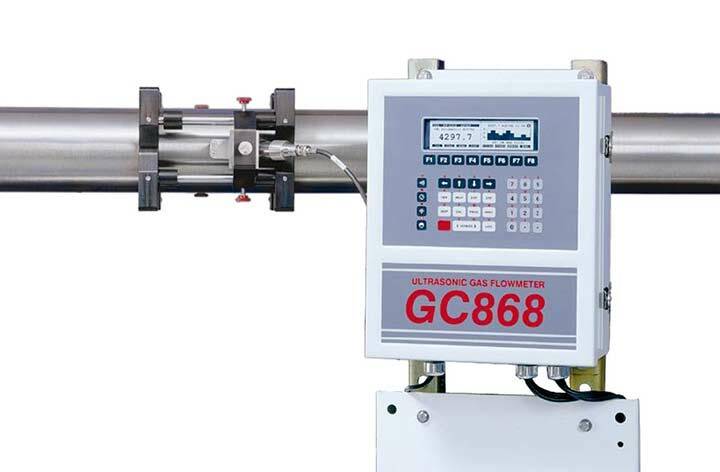 The PT878GC can measure the flow rate of almost any gas. 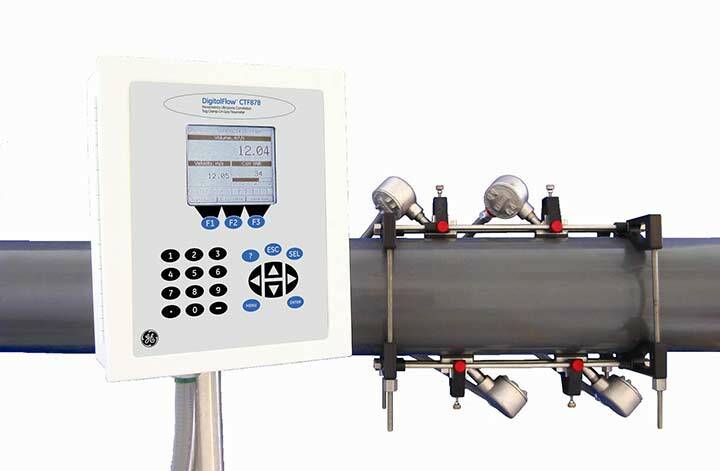 The CTF878 gas flowmeter uses two pairs of transducers and new correlation tag technology to determine the flow rate of gases. 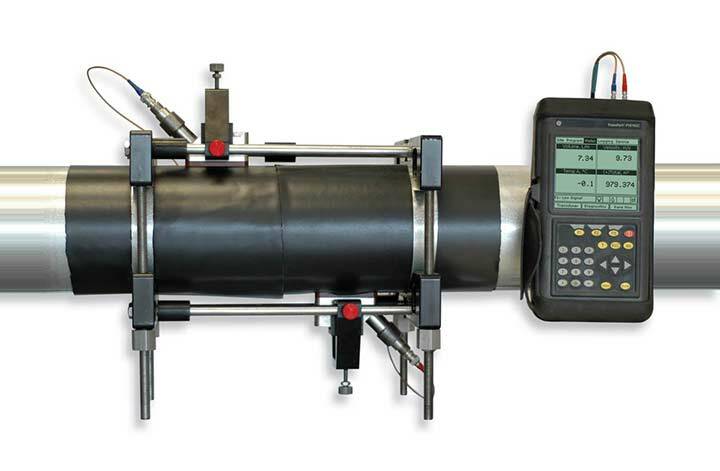 The CTF878 is the only flow meter worldwide that can measure gas in metal pipes under 5 bar and down to 0.1barg in many applications! Fast, low cost installation. Especially useful for erosive, corrosive, toxic, high-purity and sterile gas measurement. The GC868 gas flow meter is ideal for measuring most gases including steam, compressed air, natural gas, nitrogen, argon, helium and many others. As there are no modifications to the pipe, installation costs are dramatically reduced. Indeed, one instrument can be used to survey many flow measurement points in one day. The meter can be installed on any unlined pipe of metal or plastic construction from 0.75-24.0 inches in diameter with operating temperatures of -407Â° to 300Â°F. If you'd like to consult with one of our flow specialists to help you choose the ultrasonic flow measurement solution that best suits your application, please feel free to contact us.